People asked me whether I am afraid working with bacteria, virus, and any other thing that would scare other people. Yes, all of this can be the cause of death for me, and billions other people in this world. Everyday thousand of people acquired infection, and some are not lucky enough to survive it. There were many very pathogenic microorganisms that could kill us. Are we going to be killed by them? Maybe. Safe work environment is important in handling specimen that could potentially kill you. All over the world, microbiology laboratories were equipped with the safest equipment to prevent us from getting work related infection. Almost everyday, there will be a new development of tools and diagnostic technique that will eliminate the risk of getting infection. It is important for a microbiology lab to update it facilities and knowledge regarding this matter, no one wants to be dead doing their daily routine work. Some do it for money, to feed their families, some are just crazy and love to do this risky job, both do not deserve to die at work. 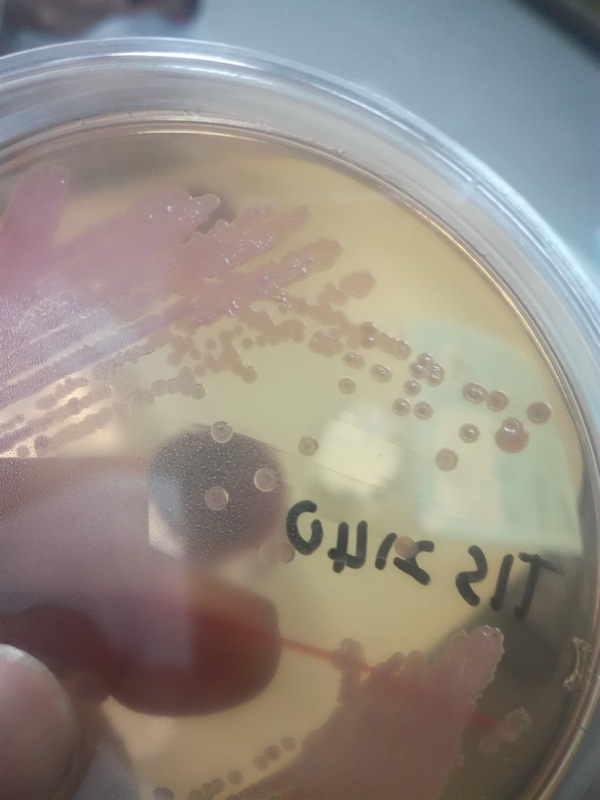 For example, for years, microbiology student were taught to sniff at culture plate as a tool to assist the identification. Certain bacteria have its own distinctive smell. Some smell like rotten flesh, some smell like dry urine, some smell like fruits, dried prawns, whiskey, wine, and there were even some which smells like perfume ( I wonder if this organism colonized someone's dead body, it will smell very nice and the dead person would automatically become holy). It does help in identification of bacteria but it also significantly increases the risk for someone to acquired the infection by inhaling that small bacteria. This practice has been stopped for few years now, yet there were still people who love to smell culture plate to help in identification. Smell is a powerful tool, but we have to accept that it was not a good practice to smell a colony of bacteria. Today, with technology, identification of bacteria is becoming more rapid, accurate and safe. Identification using Analytical Profile Index (API) changed the world of microbiology drastically. Yet, this technology is considered ancient and not safe enough. Today, we have molecular technique which is much more accurate and safe. Automated close system is going to replace the traditional way of processing clinical specimen. The latest Matrix Assisted Laser Desorption/Ionization Time of Flight Spectrometry (MALDI-TOF), has reduced the amount of time taken for identification and eliminate the complex processing techniques. Less processing techniques equals to less exposure to hazardous bacteria. Now, a microbiologist does not need to stare down at the colony for hours just to get the identification right. In the future, more safer diagnostic tools will be invented for sure. A closed system which does not require human interference would be a big gift to microbiology. We hope the future to come soon enough for us to see. As for now, am I scared of getting infection at work? Yes I do. But every job has it risk. That risk is the value of your salary. As long as we comply to the standard of quality and safe lab practices, we all should be good, yet still hope for a better future to come. A beautiful mauve colony of organism producing a metallic sheen..a shiny metallic appearance like metallic paint of a car....is a highly pathogenic bacteria Bulkholderia pseudomallei. Exposure with this highly pathogenic bacteria that can be found in soil has kill a lot of people. I too have a few patient that die from this bacteria. I was holding it in my hand, like it was nothing. Is this safe?